If you have never seen Shakespeare’s A Midsummer Night’s Dream don’t fret. Yohangza Theatre Company’s version serves up a favourite classic with a decidedly Korean flavour. All your favourite characters are resplendent in their original delightful personas but the magic and the mischief has certainly been doubled. And in the case of Puck – literally. Director Jung Ung Yang recognized internationally for his avant garde style of direction has not only rendered all the characters Korean (complete with Korean names) but the main trickster of Shakespeares’ comedy receives a double whammy as Puck’s character is transformed into two very versatile and applause loving imps known as the Duduri twins. What’s particularly special about this rendition of A Midsummer Night’s Dream is that it demands a reading and a review on its own terms. The story is infused with themes from Korean culture and folklore. While retaining the eloquence and rhetoric of Shakespeare, the translation offers a sample of the beauty of the Korean language with its rich intonations, cadences and rhythms. Additionally all performers also participate as musicians and the continous percussion adds much depth to a seamless performance of laudable comedy. 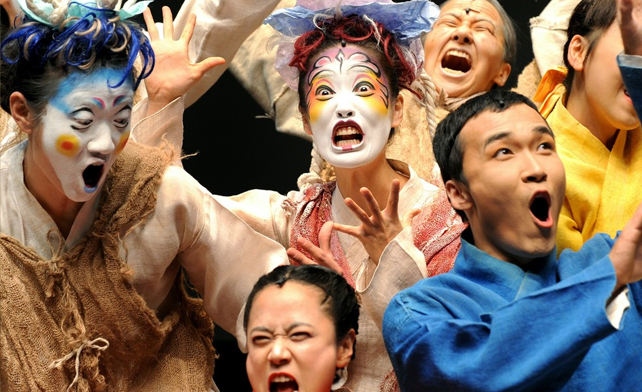 As a highly stylized work (complete with face and bodypaint) the Shakespearean story wove together music, dance, acrobatics and commedia all within the arc of Korean drama. Particularly endearing performances were given by Kim Jun-Ho playing Gabi (Oberon) and Jeong A-Young playing Ajumi (Bottom) while the Duduri twins, played by Jung Woo-Keun and Kim Sang-Bo were certainly quick favourites. Movement and music were definitely two of the main highlights. The manner in which the characters walked and danced was exquisitely defined by the power of breath while the unison and deliberation with which their interactions were mediated gave new lyricism to dialogue. The story itself had all the humour of the Bard and the details that were changed were done so successfully. Playful use of heavily accented English and references to ‘feesh and cheeps’, ‘vegemite’ and ‘tim tams’ may have been more to satisfy an Australian audience’s expectations but don’t let that allow you to sterotype this team as a Korean performance troupe! This is intercultural theatre at its most invigorating. Yohangza Theatre Company’s A Midsummer Night’s Dream is more than just a Shakespearean story ‘from the East’ – it offers a glimpse into the magic and theatrics of Korean cultural performance. A show definitely not to be missed!